Terry Nation casts a long shadow over British television, although only in very particular corners. 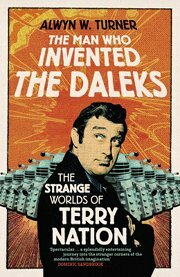 His main claim to fame (and riches due to canny licensing deals) is that he wrote the first Dalek story for the then new Doctor Who but his career stretches over many decades. Starting out as a comedy writer, he eventually made the switch to drama in the early 60s and never looked back. The list of shows he wrote for reads like a perfect rainy Saturday afternoon's viewing: The Saint, The Avengers, Doctor Who, and Blake's Seven, plus all sorts of other thick slices of cheese on toast. One of the last things he did was Macgyver, back when it was good. This biography is a bit of a strange beast. It is incredibly detailed in some respects, going over each show (and sometimes individual episodes) with the kind of meticulous scrupulousness that only the British can muster. On the other hand, Nation was a man who entered his chosen profession early, worked hard, made some contacts, and found success pretty early on. An admirable way to live your life perhaps, but not much to hang a great biography on. His childhood is covered in a few pages, somewhere along the way he acquires a wife. His first born child gets a brief mention, but only because Nation wrote a popular children's book for her. His other child only appears for a sentence or two. There are no serious setbacks along the way, no lost loves, no professional rivals. Just page after page of Nation churning out stories. And churn them out he could. Almost all his colleagues were in awe at the speed at which he wrote (his secret was never doing second drafts) and the consistent quality of his scripts (his secret was to have a lot of stock scenes that he could "recycle"). In fact, this biography is a testament the Nation's approach; like his serials each episode in the book is entertaining but the whole thing is a bit same-y if you consume the whole thing in one go. You don't even get a chase through dimly lit corridors or a bomb to liven up the plot. Only recommended if you really like this sort of thing.